Erica Feuerbacher, Ph.D., BCBA-D, CPDT-KA is an Assistant Professor of Companion Animal Behavior & Welfare at Virginia Tech. She earned her Ph.D. in Psychology at the University of Florida and her Masters in Behavior Analysis at the University of North Texas. She is a Board Certified Behavior Analyst and a Certified Professional Dog Trainer. She has attended the San Francisco SPCA Dog Trainer Academy, and has worked as a shelter behaviorist and ran an off-site adoption program. At Virginia Tech, she teaches courses in companion animal behavior and welfare, and conducts research on domestic dog learning, behavior and welfare. 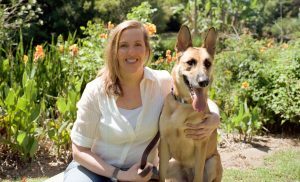 Her current research focuses on how to decrease shelter dog stress, including the effects of brief fostering and housing practices, how to improve training, including the effectiveness of different reinforcers, and how to improve the human-dog relationship. She has published a variety of scientific and popular articles on her research on learning theory and the dog-human interactions.